1. If you’re not using left over rice, start by cooking the rice following packet instruction. Drain, cool to room temperature and place in the fridge for an hour or so. 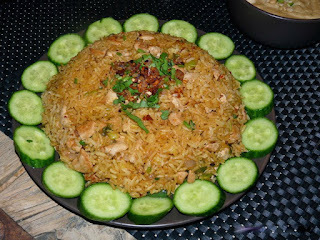 Note that it’s important to use cold cooked rice as freshly cooked rice is too soft and will absorb the oil. 2. Heat the oil in a wok over high heat. Fry the chicken for 2-3 minutes or until nice and brown. Season with salt & pepper. 3. Add the shallots, garlic and toss around for a couple of minutes. Add the chili, turmeric, and spring onion and fry for another minute. 4. Add the rice, mix and toss well. Add the Soy sauce, Worcester, ketchup and fish sauce. Season to taste. 5. Garnish with fried shallots and fresh coriander. I didn’t include shredded cabbage or eggs omelette in mine, as I was serving it as a side to my chicken sate, but definitely add it in for a more substantial stand alone dish!